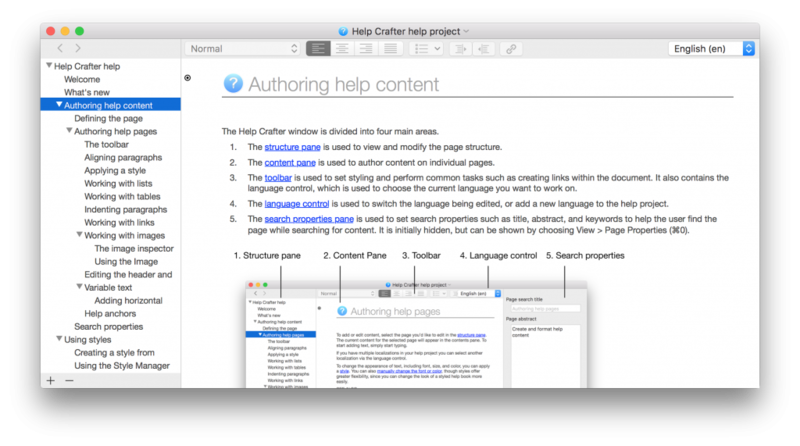 Help Crafter is designed to work like your favorite word processor. You create pages as you go, and drag them in the navigation sidebar at any time to change the structure. You author each page using Help Crafter’s powerful state of the art word processor. You can drag images into your project, then resize them so they fit your content perfectly. And if you are publishing in multiple languages, Help Crafter supports multi-language help content. When you are ready to publish your help you can generate your fully indexed, localized help bundle in seconds. Help Crafter is available exclusively from the Mac App Store for US $39.99. See how easy it can be to author help for Mac apps. Buy Help Crafter from the Mac App Store now, or order a free trial.